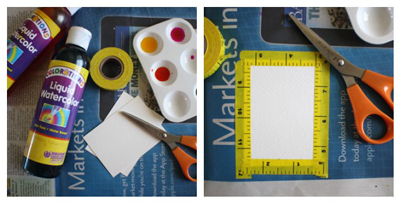 I've got three nifty ways to art it up tiny style. These little works of art will fit nicely in Mama or Grandma's wallet and would even look just dandy displayed on the fridge or pinboard. Add a tiny frame and well then you'll have a masterpiece! Here is project number 2! 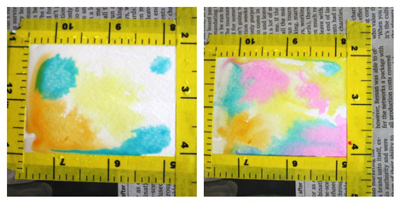 Tape your tiny ATC paper down to a sheet of newspaper or plastic placemat using painters or quilters tape. It's really important you use one of these kinds of tape otherwise your child's tiny little masterpiece will most likely get a wee bit shredded. These two kinds of tape lift up quite nicely (they might however really stick to the newspaper). Taping the paper down will both anchor it in place and create a pretty matte once it is finished. 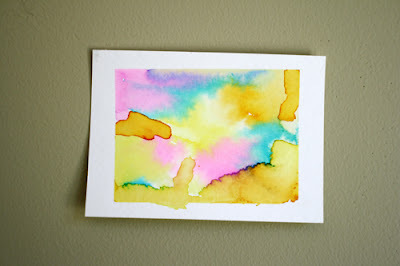 An ATC is also called an Artist Trading Card and blanks can be found at your local art store or on etsy. If you do not have access to this tiny paper you can cut it up yourself. An ATC generally measures 2 ½ X 3 ½ inches or 64 X 89 mm. Make sure you use a sturdy watercolor paper. It amps up the quality of your wee artist's work and keeps it nice and sturdy for wallet traveling. 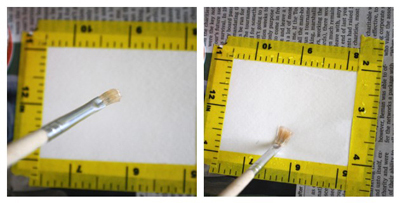 Have your kiddo dip a clean paintbrush into their (clean) water and have them paint their taped paper with the wet brush. Next, beginning with the lightest color first, have your kiddo dab their brush into their paint and touch it to their paper. Oooh...look at that paint travel! The wet canvas will carry their paint a wee distance following whichever small valleys have formed from the water wash. Limit their color palette to 2-4 colors and keep them in the same family so that if if and when they mix they will make a pretty color and not brown, unless brown is Mama's favorite. Clean brush and move onto another color. 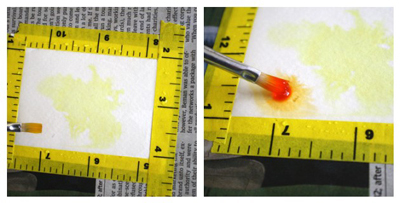 Use a tissue or soft cloth to dab excess paint if it gets too wet or muddy. **An added bonus would be to have your kiddo write their name or tiny message to the ATC paper with a white crayon before painting. If your kiddo has just begun scribbling, ask them to write their name before painting. This would be all kinds of awesome! Grandma would love this as well. All images and content (c) 2007 - (c) 2019, Jessica Wilson, unless otherwise noted. Unauthorized use of images or content without permission is prohibited. Please give me a shout out if you have any questions!